Pre-workout is very important meal because it helps you by giving you a boost in your workout; it helps you to perform well in the workout. If you are a fitness enthusiast or a beginner and you don’t know what to eat or drink before a workout so you are at the right place, we will show some meals which you can eat or drink before your workout. 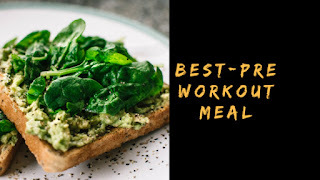 Pre-workout can be any form it can be a smoothie or it can be a fruit salad, there are very fewer options in which you can get a natural pre-workout, pre-workout is for all peoples who want to lose weight or want to gain muscle. Banana smoothie - you can make a protein smoothie of milk, you have to add 1 banana, 1 tablespoon of peanut butter and grind it in a mixer and you are ready with your protein smoothie. Banana is a store of good carbohydrates and milk contains the quality protein which gives you the fuel in your intense workout, milk is loaded with bcaa in it which is essential for a pre-workout meal because it gives you the better pump in your workout, milk contains calcium in it which helps to make the bones strong, drink milk which is fat free will be a good option a pre-workout smoothie. Oats - you have to eat before your workout because oats are the best source of complex carbohydrates which is slow digesting carb and gives energy for an intense workout. You can eat an apple because it contains a good amount of carbohydrates in it, You just have to add 50 grams of oats and a half apple and 1 teaspoon of peanut butter and you are done with you natural pre work out meal, its very healthy meal and loaded with nutritional values in it, it gives you more energy in your workout and you can eat it one hour before your workout. Whey protein - is that kind of protein which you can purchase it from the market and drink it 30 minutes before your workout, it gives you the real pump in your workout and helps in your muscle recovery, it contains 3 type of amino acids which our body doesn’t make itself, whey protein is definitely a good option. Chicken rice - chicken is a great source of quality protein and contains amino acids in it and it provides the good muscle recovery, and brown rice is a good source of complex carbohydrates which is a slowly digesting food which helps you to give more energy in your long workout. you can mix both and eat it one hour before your workout. Potato with yogurt - is a great source of carbohydrates and loaded with many nutrients and yogurt is a dairy product and the good source of proteins and it contains carbohydrates too, you can mix them both and take it 40 minutes before your workout.